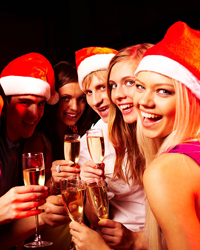 Takeaway alcohol can only be purchased up to 12 midnight on Christmas Eve. No takeaway liquor can be sold on Christmas Day over the bar or from bottleshops. On Christmas Eve, all gaming machine operations must cease at 12 midnight and may not recommence before 10am on Boxing Day. Liquor trading must also cease at 12 midnight, regardless of whether you have approved extended trading hours that allows for later trading. The sale and supply of alcohol must cease at 12 midnight but patrons have a grace period to finish their drinks and leave the premises by 12.30am. On Christmas Day, no gaming is permitted on licensed premises. You will be able to sell or supply alcohol to patrons from 10am but only in association with a meal prepared on the premises and eaten in an area of the premises ordinarily set aside for dining. A meal is defined as food eaten by a person at a fixed structure used as a table, with cutlery provided for the purpose of eating the food, and is of a sufficient substance to be ordinarily accepted as a meal. Alcohol may be supplied for one hour before dining, while the meal is being eaten and for one hour after finishing the meal. On Boxing Day, usual liquor trading hours and conditions resume. No gaming is allowed between 12 midnight Christmas Day and 10am on Boxing Day when usual trading hours resume. On New Year’s Eve, all licensees are permitted to trade liquor until 2am on New Year’s Day and gaming until 2:30am. This applies regardless of your regular approved trading hours. This means that the bar must finish serving at 2am, unless the premises is currently approved to trade beyond 2am. If this is not the case, patrons must finish drinks and leave the premises by 2.30am. For further information please visit the Office of Liquor and Gaming Regulation website (OLGR).